Secure file sharing software information, file sharing trends and announcements. If your organization handles controlled unclassified information (CUI), you know how crucial it is to keep that data protected. NIST (National Institute of Standards and Technology) 800-171 was written specifically for organizations like yours to provide guidance on appropriate handling of sensitive data. NIST 800-171 Questionnaire: Are You Complying With These Access Control Factors? Are you complying with NIST (National Institute of Standards and Technology) SP 800-171? Because there are so many security controls you must have in place, it can be difficult to determine if you are in total compliance. 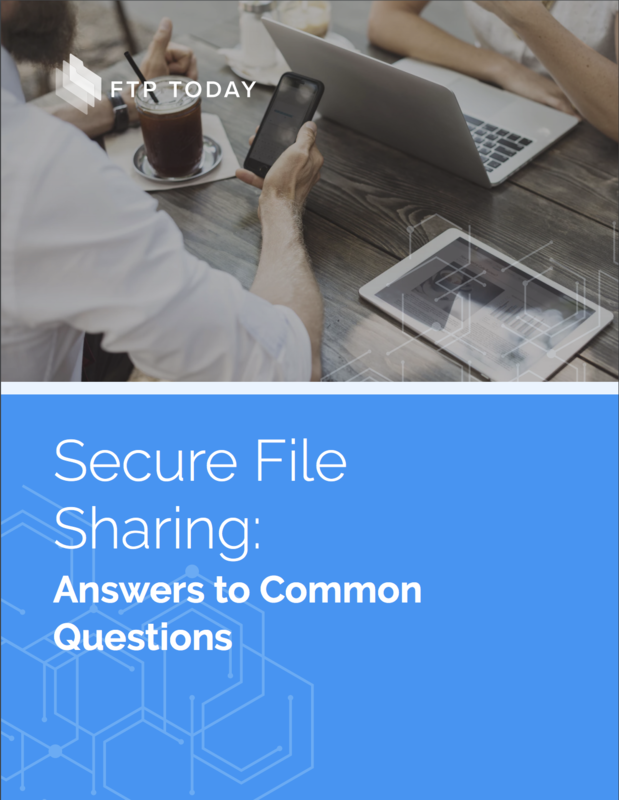 Get the answers to your secure file sharing questions! Are you trying to select a new file sharing solution, but you have a few questions first? Explore these common questions about file sharing solutions and find out their answers. Are you looking for clarification on the CUI (Controlled Unclassified Information) security measures recommended in National Institute of Standards and Technology Special Publication (NIST SP) 800-171? These government guidelines can often seem complex, and it can be a challenge to determine the extent to which you have aligned with their policies. Parsing through the business requirements and risk assessments associated with appropriate CUI security protections can be a drain on your time and resources. Does your organization have security controls in place, but you’re unsure if they’re effective or align with NIST (National Institute of Standards and Technology) guidelines? NIST Special Publication 800-53 was created by NIST as a benchmark for successful security control assessments. The National Institute of Standards and Technology (NIST) Special Publication 800-171 provides organizations with guides on how to store, share, and protect controlled unclassified information (CUI). To meet NIST 800-171 requirements, there are four areas where you should focus your efforts – access controls, activity monitoring and management, user behaviors, and data security measures. These are the areas where mistakes could open the door for a data breach. Has your company taken steps to be compliant with NIST 800-171 regulations? December 31, 2017 was the deadline for companies to be compliant and implement NIST 800-171 requirements. However, many companies may have missed the deadline or have only met some of the compliance requirements, but not all. ITAR, or the International Traffic in Arms Regulations, is a set of regulations drafted to ensure the protection of government defense data, including articles and services on the United States Munitions List (USML) and all related technical data. Only companies that have registered with the Directorate of Defense Trade Controls (DDTC) are permitted to import and export defense data. Each year companies are required to renew their registration with DDTC and recommit to maintaining ITAR compliance. When trying to evaluate the cost of FTP hosting providers, there are many factors you need to consider that directly affect the cost. Because companies of different sizes and in different industries have their own unique needs and budgets, many file sharing solution providers offer numerous solution tiers with varying capabilities based on cost. In this article, we’ll explore the different FTP hosting costs associated with each tier offered by a top provider. For federal agencies and the contractors they work with, compliance is a daily objective and concern. With so many compliance regulations – especially ones pertaining to data security – it can be a challenge to keep up with every security control that needs to be implemented and updated. Is your organization working to align with NIST (National Institute of Standards and Technology) Cybersecurity Framework? The objective of the NIST Cybersecurity Framework is to identify “a prioritized, flexible, repeatable, performance-based, and cost-effective approach” to keeping data secure. This includes “information security measures and controls that may be voluntarily adopted by owners and operators of critical infrastructure to help them identify, assess, and manage cyber risks.” To put it simply, the NIST framework is a set of guidelines to help you protect sensitive government data. In 2002, the United States government took steps to address a relatively new and growing concern – data security in the 21st century. The passage of The E-Government Act (Public Law 107-347) brought security into the internet age, and as a result, FISMA was created. FISMA, or Federal Information Security Management Act, was drafted in 2003 and later updated in 2014 to the Federal Information Security Modernization Act. If you’re subject to FISMA requirements, you may be wondering what steps you should take to comply with these regulations. Continue reading to learn more about FISMA compliance and the actions you can take to align with the standards. NIST standards are vital for both federal and nonfederal organizations alike. These guidelines were designed as a set of best practices that, when applied to your data storage and sharing practices, can help you prevent a security breach. Learn more about the basics of NIST standards, how these standards are created, and the value of using the best practices in your own file sharing processes. The U.S. government is reliant on contractors and subcontractors for special projects. As such, unclassified defense information, or Controlled Unclassified Information (CUI), is often shared with these partners. Though this information is not classified, it will still be sensitive information that should only be accessed by approved parties. This is where NIST (National Institute of Standards and Technology) 800-171 comes in. These are a set of guidelines for secure handling of CUI, especially as it pertains to where this information is stored. Contractors may not use federal data storage systems, but it’s still essential that the solutions they do use align with NIST standards. Does your organization need to comply with DFARS (Defense Federal Acquisition Regulation Supplement) regulations? The objective of DFARS is to prevent the United States military from being too dependent on raw materials from foreign countries. And complying with these regulations can seem like a major burden, especially when you’re trying to select contractors and subcontractors. Maintaining CJIS (Criminal Justice Information Services) compliance might seem like a heavy burden for some law enforcement organizations. But with the right tools in place – like cloud-based file sharing – you can turn your attention from compliance back to your job. Criminal Justice Information Services (CJIS) protects private or sensitive information gathered by local, state, and federal law enforcement agencies. This could include fingerprints, criminal background information, copies of private documents, or anything else that could be classified as sensitive. ITAR Requirements for Your Employees: Who's at Risk? ITAR (International Traffic in Arms Regulations) compliance isn’t just an initiative that’s only a concern for those at the top. Every employee plays a role in protecting your data. And, it’s imperative that you know which employees are approved to handle ITAR-related materials. To ensure you’re meeting ITAR requirements for your employees, learn more about how ITAR applies to the people in your company. What Are ITAR Certification Requirements? Many people in your industry or others impacted by ITAR (International Traffic in Arms Regulations) are probably asking themselves, “Do we really need to be ITAR compliant?” or “Do we need ITAR certification?” Explore this article on how to be ITAR compliant and what ITAR certification means for your company. Do you believe your products or data are subject to ITAR or DDTC compliance, but you’re unsure how to align with these regulations? Before you can start aligning with compliance standards, you need to know how to conduct ITAR business in alignment with DDTC controls. Explore this article on how to keep your file sharing practices DDTC and ITAR compliant, and learn how the right secure file sharing solution helps you avoid the risks of noncompliance. The United States government has shut down AMRDEC SAFE (Army Aviation and Missile Research, Development, and Engineering Center - Safe Access File Exchange) due to major security concerns with the service. SAFE enabled government agencies and contractors to securely share large files with approved parties. However, outside organizations identified major security risks with the service, and it is currently unclear if SAFE will be reinstated. Is your business subject to ITAR or EAR regulations? If you’re unsure, it’s essential that you find out – fast. Otherwise, you could face serious consequences for noncompliance. To find out which regulations your business is subject to, explore what ITAR and EAR cover and how a file sharing solution can make compliance easier. File Sharing Q&A: What Are File Sharing Alternatives? Have you been tasked with finding a new file sharing alternative for your company? While you’re the expert in your business, you may not have expert knowledge about file sharing alternatives, or how to choose the right option. Don’t worry. There are experts in this field who can answer some of the complex questions that come with adopting a file sharing solution. And, when you know more about your options, you’ll be equipped to make the right decision. For more insight, explore these answers to some common questions about file sharing alternatives. ITAR Compliance: How Does File Sharing Software Comply with Transmission of Data Standards? ITAR (International Traffic in Arms Regulations) is a set of government regulations designed to control the export and import of defense-related articles and services. These regulations, which impact a wide range of companies, are in place to ensure that regulated technical data – both physical and digital – is only used by U.S. persons employed by the government or a government contractor. This protected data is outlined in the United States Munitions List (USML), and the goal is to keep these potentially dangerous products out of the hands of civilians, enemies of the government, or possible criminals. File sharing solutions can be a great asset for you company, but sometimes it can be hard to find the right balance between a solution that’s secure and a solution that’s easy to use. When you find a file sharing option that meets both of those needs, you can increase productivity by making data sharing processes both simple and uniform. You can also keep you data protected, safe from hackers with sinister motives. One file sharing method that might be ideal for your company is FTPS. FTPS builds off the simplicity of the traditional FTP data transfers and adds a needed layer of security to keep data protected from prying eyes. In this article, you’ll learn more about how FTPS works and how it protects your sensitive files. You’ll also explore the differences between the types of FTPS you can use – explicit vs. implicit FTPS. How Do I Know Which File Sharing Solution is Right for Me? With so many file sharing solutions on the market, it can be hard to determine which option can meet all your company’s needs. The best way to evaluate a solution is by asking yourself what you need from the file sharing solution, outlining your goals, and trying it out for yourself. Learn a little bit more about how to choose the right file sharing solution for your company. What is the Biggest Cybersecurity or Data Threat? If you’ve tuned into or read the news lately, you’ve probably seen a story about a data breach or a hacker gaining access to sensitive data. For companies that use sensitive data, cyber attacks should be a huge concern for your team, and something you’re actively striving to prevent. Here are four of the biggest cybersecurity threats your company might be up against, and find out what steps you can take to prevent these types of data breaches in the future. What is the Most Cost-Effective File Sharing Solution? For most businesses, budget is a huge factor in every decision, including choosing a file sharing solution. Are you looking for a cost-effective solution to help you better manage, share, and secure your files? Before you go with the cheapest option, there are a few things you should know. In this article, we’ll compare three file sharing solution options, the costs associated with each, and how to determine which one is right for your business need. Does your company have a working and enforced data security policy? While you may have a few rules that you try to enforce here and there, it can be difficult to keep data safe without a comprehensive and coherent data security policy. As you’re coming up with the data security policy for your company, it’s important to keep a few key actions and procedures in mind. Explore the following actions and procedures that should be incorporated into your data security policy. Have you ever accidentally deleted an important file? Maybe the power went out right as you were about to save something. When it came back on, all your hard work was lost. On a personal level, lost data is a nuisance. On a company-wide scale, lost data can be a huge problem. Disaster recover is an important file sharing solution feature that is easy to overlook. You might be more worried about solution price and data security, forgetting to ask about disaster recovery in your selection process. However, disaster recovery plays a vital role in maintaining productive operations, with your backups essentially working as an insurance policy against lost data. Adopting a new file sharing solution can be a big investment for your company, both from a time and monetary standpoint. So, before you take the leap, you need to be sure you’re choosing the right option. As you evaluate all of the corporate FTP solutions on the market, it can be hard to tell how they differ. If every solution claims to be the best option, how can you choose the one that’s actually right for your company? Use the following questions to help you differentiate between the various corporate FTP solutions. The FTP providers’ answers to these questions will give you insight into which solution is best. Are you looking for a secure FTP hosting option that will fit your company's needs? A simple internet search for “FTP solution” will show you the sheer number of options available. How will you choose the right one? A smart way to ensure you pick the ideal file sharing solution for your business is to schedule free trials, so you get a feel for the solution and its capabilities. This is called Proof of Concept (P.O.C.). It’s also wise to see how each solution stacks up against the competition. Let’s look a few different secure FTP hosting options to determine which one is ideal for your business. Whether you’re running a law firm that needs to send large amounts of case data internally or you work at a healthcare company that needs a secure way to share patient data, file transfers are a big part of your daily work activities. But, choosing the best methods for file transfers isn’t easy. There are a lot of options out there, from simply emailing files to coworkers or clients to using a more sophisticated methods like FTP (file transfer protocol). FTP, like any other solution has drawbacks and benefits, so it’s important that you understand FTP fully before making your decision. If you’ve been searching for the right SFTP solution for your business, you’ve probably been looking at important features like price, number of users supported, disaster recovery processes, and more. But, one essential SFTP feature you may have overlooked is email alert configuration. Before you choose a top SFTP provider, it’s important that you know how this feature impacts your file sharing processes. FTP, SFTP, SSL, SSH. With so many acronyms, it’s hard to keep these protocols straight and differentiate between all the different options. SFTP is a wise choice for companies that need to keep data secure, but many people don’t know what SFTP means. All businesses look for ways to save time and money without compromising quality or security for their customers. But most aren’t willing to rock the boat if their current solutions are just good enough to get by. With every transition, concerns about cost and lost productivity arise. And while you might recognize the need for a new FTP solution, you might be concerned that your company’s decision makers won’t be on board with the move. However, it is possible to change the perception of a CEO or decision maker who believes a hosted FTP solution can’t benefit their business and offer a high enough the ROI to justify the investment. You just need the right talking points to convince them. Hiring remote employees is the easiest way to expand your talent pool, provide a perk your employees are sure to appreciate, and possibly increase security risks. If you don’t properly prepare to offer this perk or choose the right solutions, the data security risks could outweigh the benefits. If security and convenience are important factors in your file sharing solution selection process, an SFTP cloud solution could be the best choice for your business. Before you start shopping around, learn a little bit more about cloud SFTP solutions and a few benefits they hold for their users. Are you in the market for a new file storage server? If so, you’ve probably heard the terms “FTP server” and “file server” tossed around. These two solutions are similar, and many people make the mistake of using the terms interchangeably. But, FTP servers and file servers have some distinct variations that could mean one is right for your business and the other isn’t. Before you are able to choose the right server for your needs, it’s crucial that you understand exactly what FTP servers and file servers are. Then, you need to know more about their similarities and differences. Once you have all the facts, you’re equipped to choose the best server for your business’ needs. As the programs you use to protect your information get more sophisticated, so does the malware designed to steal from them. Malware, or malicious software, is used by hackers to gain authorized access to data. Malware has been around for a while – think computer viruses – but methods are growing more advanced each day. Now, hackers use stealthy methods like Trojan horse software designed to look like a legitimate website or ransomware which requires users to pay a ransom while hackers hold their data hostage. You’ve probably seen numerous articles talking at length about the different ways to secure your data and protect yourself and your company. But, what happens if the damage is already done? Whether you’re cleaning up from a malware attack or you just want to be prepared for the worst, you need to have an plan for what to do when a breach occurs. When people search for a secure file sharing solution, there are a few features that they tend to focus on, like price, cloud options, implementation timeline, and more. But, control features are an essential aspect of a secure file sharing solution that you should consider, too. There is no doubt that the ease of deploying an Enterprise File Synchronization and Sharing (EFSS) solution is desirable, making it a fine option for some file sharing needs. But, with every item in the pro column for an EFSS solution, there are plenty of cons. Before you choose an EFSS system for your company, make sure you take this type of file sharing solution’s drawbacks into consideration. With all the different types of file sharing services out there, it can be hard to figure out which one is right for you. The best way to choose the right type of file sharing solution is to first determine what you want your solution to do. In this article, we’ll touch on a few different objectives you might have when it comes to a file sharing solution. As you read through these goals, determine which ones are important to you. Once you know what your goals are and the reason behind using a file sharing solution, you ready to pick a solution to implement. While enterprise cloud-based solutions have become a top way for companies to share their files, 66% of workers continue to use free file sharing to share corporate documents. When employees use these free options, your company could be at risk. There are a number of reasons public cloud file sharing options problematic, but the biggest drawback is the lack of security. You might be tempted to use Dropbox or Google Drive due to the convenience, low price tag, or simplicity. However, these public solutions don’t provide the granular access controls or the security protections to meet your company needs. Enterprises have very different requirements for file sharing solutions than small businesses do. You’ll have hundreds, maybe even thousands of users logged into your solution each day. It’s vital you choose a solution that promotes file sharing best practices for your users and can withstand the massive data storage demands many enterprises face. If you’re looking for a file sharing solution for your company, where do you start? There are so many options on the market, but only a few are designed to support the needs of a large enterprise. Explore these four questions you should ask in your search for an enterprise file sharing solution to ensure you’re making the right choice. Are you looking for a new SFTP solution for your business? When you simply Google “SFTP server” more than a million links come up. It’s easy to get lost in all of the available options when you’re researching an SFTP solution. Before you start looking, you need to set a few guidelines that will help you narrow down your choices, and ultimately choose the best option for your business. Explore these four must-have features you should look for when considering an SFTP server. When the term “cloud computing” was coined back in 2006 everyone was intrigued by how it worked. Fast forward more than a decade and not much has changed. Just because you might not fully understand how the cloud works, doesn’t mean you should ignore it. This is not an “ignorance is bliss” situation. You need to take control of your cloud file sharing process. Explore three ways you can stay in control of your cloud file sharing security, and find out four mistakes that cause companies to lose control. Over the last few decades, the internet has changed how people work. In the past, employees sat in their cubicles or offices working independently. But, with the internet and cloud solutions of today, businesses can facilitate increased productivity and collaboration. Your file sharing options have kept up with these advances, as well. That’s why online file sharing solutions are gaining traction in industries like healthcare, government, finance, law, engineering, and more. Now, you can choose an online sharing solution that enhances the way your employees work, regardless of what industry you’re in. Are you working hard to keep your file sharing processes HIPAA compliant? For many companies, they think their file sharing is secure, but they’re not positive they’re aligning with all the applicable HIPAA requirements. And, unfortunately, in many cases, you don’t there’s a problem with your file sharing security until a data breach occurs. Today, in the face of large scale data breaches, data security is becoming more and more important for companies everywhere. A data breach, in addition to being an inconvenience, can carry a number of consequences that could put your company at risk, like huge fines, jail time, loss of business, and damage to your reputation. That’s why it’s crucial that you have security measures in place to protect your data from even the most skilled hackers. In the face of evolving technologies and sophisticated security threats, HIPAA compliance has never been more crucial for companies handling protected health information (PHI). To gain a better understanding of the relationship between HIPAA and today’s cybersecurity threats, Security Metrics recently conducted surveys of more than 300 different healthcare professionals responsible for HIPAA compliance. During these surveys, they uncovered key statistics from this past year that you might find surprising. If you’re a business owner, you know that cost is a factor in every decision you make. So, before you choose a file sharing solution, you should weigh the costs associated with two different options: building an in-house FTP server and adopting a hosted FTP solution. Verifying that someone is who they say they are is essential for keeping your company’s data safe. In the past, a single, unique password might have been enough protection to keep potential digital thieves at bay, but hackers’ methods have become more sophisticated with each passing today. So, what can you do to maintain the wall of security around your data? While the cloud presents a number of opportunities for large scale data storage accessible anywhere, anytime, many potential users still harbor concerns about data security. Can the cloud really be as secure as an in-house private server? Fortunately, many top FTP cloud providers recognize the importance of data security, and have taken steps to ensure data is as safe on their cloud servers as it would be on any other solution. But, not every provider offers the same levels of data protection. And, not every company using a cloud FTP server takes the necessary steps to keep data safe. If you want to ensure you’re storing data on a secure cloud server, you need to take the following actions and select a FTP cloud solution that can support your data protection efforts. Are you tired of maintaining your in-house server? The high costs, regular maintenance, and data security require a lot of time and resources from your company. That’s why many companies are looking to move from in-house servers to a managed online FTP solution. While it might seem like a daunting task to switch over, a hosted FTP solution offers too many benefits to pass up. To ensure you choose the right online FTP server, explore this checklist for features you need in your next FTP solution. For government agencies or contractors, data security is a top concern. Between highly publicized breaches to multi-million dollar fines, the consequences could cripple any organization. And, it seems like there’s a new data security concern popping up each day. So, many organizations are taking a closer look at their FTP alternative options to determine which path is best for protecting their data. Data loss is a huge threat for many companies, especially those working in the government or as government or military contractors. Often, your company and those like it are handling data with the highest levels of sensitivity, making it imperative that you protect it. But, due to hackers with nefarious motives or employees that are just plain careless, sensitive data can easily be compromised. Building a data loss prevention strategy to ensure sensitive data is not leaked outside of the company or to unintended parties is a growing objective for many companies. Without a strategy in place, your business could be susceptible to lost data. Keeping data and information secure as a military contractor is vital. Not only is it key for maintaining your reputation as a trustworthy military contractor, it’s also mandated by ITAR (International Traffic in Arms Regulations). These U.S. government regulations control the import and export of defense related data pertaining to items on the USML (United States Munitions List). The chief aim of ITAR is to ensure that sensitive data is shared only with authorized U.S. citizens and doesn’t fall into the hands of foreign countries or persons. For many companies, ensuring data is securely shared both internally and externally has become a growing priority. With the threat of hackers looming, protecting sensitive data is no longer a want – it’s a necessity. And, encryption is a security measure companies have adopted to make sure their data is safe when transferred from one user to another. While many companies have concerns about securely transferring data, they’re forgetting about the vulnerabilities of data at rest. Even when valuable data isn’t being transferred, it’s still important to shield it from threats. At-rest encryption is the only way to ensure your stored data is protected, even when you’re not using it. If you want to protect your at-rest data from the threat of unauthorized access, learn more about at-rest encryption and the number of benefits that come with it. How Does FTP Cloud Storage Work? If you’re shopping for a file transfer solution, you’ve probably heard a lot about “FTP cloud storage.” Maybe you know a little bit about the cloud or a little bit about FTP, but you may not know exactly how these two concepts connect and work together. Folder Access Permissions: How Do FTP and File Sharing Alternatives Compare? When searching for a file sharing solution, many people look at features like price, storage space, or the number of users accommodated. While all of these are important items to consider, you don’t want to look past what may be the most important feature of file sharing solutions – folder access permissions. When comparing different file sharing alternatives, you need to consider what level of folder access permission control you will have. Explore this article to learn more about why folder access permissions are important, and find out which top file sharing alternatives offer these permissions and which ones fall short. If you are looking for a new file transfer solution, there’s a chance you have a long list of features your next solution should provide for your company. Maybe you need a solution that offers the highest level of security. Or perhaps your solution should accommodate an unlimited number of users. But, there are two features that are essential to efficient operations that many FTP solution buyers overlook: amount of file transfers and file transfer bandwidth speed. If you’re a business owner, you know that growing and improving your business is an all-encompassing job. Growth is a top objective for most companies, but with limited resources, it’s hard to grow your company successfully. To grow, you need to examine every aspect of your operations. It’s easy to overlook tools like online FTP solutions. But, the right solution can enable growth and promote greater efficiency and profitability in your business. Explore five ways the right online FTP solution can support your business’ growth initiatives. If you’re searching for your next file transfer solution, you’ve likely noticed that there are a wide variety of options on the market. While it’s helpful to have choices, it can be a challenge to identify the differences between file transfer solutions that seem similar on the surface. The Payment Card Industry Data Security Standard (PCI-DSS) is designed to help organizations keep cardholder payment information secure. This payment data can be generated from major debit, credit, prepaid, e-purse, ATM, and POS cards. To maintain a thorough level of security protecting cardholder data, the latest PCI-DSS version specifies a number of “control objectives” to help organizations strengthen their networks and servers against the constant threat of a data breach and meet PCI-DSS file sharing requirements. Explore four key objectives your organization should work toward to maintain compliance, and learn what actions you can take to ensure you meet these PCI-DSS file sharing requirements. If you work in the finance industry, you know how crucial it is that you keep your clients’ card payment information safe. Not only could your company face the risks of lost business and a damaged reputation, but you could also be subject to fines for failing to meet Payment Card Industry Data Security Standard (PCI DSS) compliance regulations. Data security is crucial for many companies, especially ones in the medical, financial and government-regulated sectors. When you fail to comply with applicable regulations, you could face a number of risks including fines, loss of business, damage to your reputation, and in the most extreme cases, jail time. In September, Equifax, a top consumer credit reporting company, was hacked, compromising sensitive personal information like social security numbers, birthdates, licenses numbers for 143 million Americans. If you weren’t already worried about cyber security threats, this breach should definitely concern you. Keeping your data safe is crucial, both for protecting your clients and preserving your company’s reputation. And, one of the biggest threats to data security is the way files are transferred. Ensuring your employees are securely and properly transferring files is not just a good idea anymore – it’s a necessity. In fact, 32% of companies say that they fell victim to cybercrime last year. Alternative Solutions for Secure FTP Services: Which Option is Best? For decades, companies have relied on FTP (file transfer protocol) as their basic method of transferring files. However, as data security became a larger and more urgent issue for many companies, a number of alternative FTP solutions arose to address the security vulnerabilities of basic FTP. FTP is the foundation for many of the alternative FTP solutions companies gravitate toward today, though steps have been taken to add layers of security to basic FTP. But, with so many alternatives on the market, it can be difficult to determine which options meet your file transfer needs and which options fall short. Secure FTP Solution Price Comparison: What’s Your Best Option? If you need a new FTP solution, you’ve probably noticed that there are plenty of options on the market to choose from – perhaps too many! Because you have so many choices, it might seem like a challenge to select the best one to invest in. A common mistake companies make in the buying process is basing their decision solely on secure FTP solution price. While price is an important aspect to consider, opting for the cheapest option never leads to the best results. Instead, you need to choose a solution that provides the greatest value for its price. In-House vs. SaaS FTP Software: How Do They Compare? In-house or an SaaS solution? This is a question many companies are face. Building your own FTP solution sounds seems like it might have some advantages, like having ultimate control over your file sharing process. But, ultimate control comes with significant responsibility. Relying on an in-house solution for your file sharing process incurs high FTP software costs. And, high costs aren’t the only draw back. Hosting your own system requires you to pour vast amounts of time into implementation and management, and puts your data security at risk. Find out how choosing an SaaS solution cuts down on your FTP software costs, puts time back into your schedule, and makes it easy to keep your data secure. When many companies search for an FTP solution, they assess a number of important factors like cost, implementation time, or FTP provider. While these are essential aspects of the selection process to consider, you should evaluate the interface of an FTP solution, as well. Each day, your users and administrators will be active in your FTP system, and you want to make sure the interface you select is well designed, without being too complex for users to easily understand. When your FTP solution has an ineffective interface, a significant amount of time can be wasted on administrative and file management tasks. To save both time and cost, evaluate the interface of an FTP solution carefully before you make your selection. If you are struggling to determine the best secure file transfer solution for your business, you’re not alone. Because there are many options on the market, it can be difficult to discern between your choices. Which solution has the best features? What's the best value for my investment? What option will integrate with our current operations? These are common questions file sharing solution buyers ask. To identify the best secure file transfer solutions and determine the option aligns with your needs, learn more about five popular file sharing solution – Brick FTP, SmartFile, Share File, DropBox, and FTP Today. With a comprehensive view of your options, you’re equipped to choose the best secure file transfer solution. Have you been putting off a much needed upgrade to your file sharing solution? Or perhaps, your company doesn’t have a file sharing solution at all and you’re in desperate need of one. Many companies procrastinate adopting a new solution, because they dread the process of implementing a new system and interrupting their productivity. However, selecting a new file sharing solution doesn’t have to be this painful. You just have to know the right steps to take when evaluating a solution. When you make the right selection, the best file sharing solution aligns with your company’s current operations and could enable you to achieve your future business goals. Explore the following actions you should take to ensure you’re selecting the best file sharing solution for your business’ needs. Are you considering switching to a new file sharing solution? For many companies, the prospect of switching to a new solution might sound like a nightmare. System implementations often lead to a number of issues, like miscommunication, impacts on productivity, lost data, and more. However, switching file sharing solutions doesn’t have to be a nightmare, and your company’s productivity doesn’t need to suffer, if you take the right steps to prepare for the transition. Whether your company is completely migrating from a legacy FTP solution or simply upgrading to a more secure FTP solution, exploring and understanding your solution options enables you to protect your team’s efficiency. Take a moment to think about how much data your company gains, transfers and stores each day. In fact, the amount of data transferred daily is probably staggering. However, with so much information flowing in and out of your company, it’s difficult to maintain compliance with your data security policies across all fronts of your business. To ensure your data is continually secure, your company should have a file transfer protocol (FTP) service in place to keep up with these data demands. If you don’t have an FTP service or one that provides maximum protection for your data, you need to carefully consider what you could do to improve the security of your organization. Is My File Sharing ITAR Compliant? A strong flow of information is the heartbeat of any business or organization. To keep your operation on pace, you need a file sharing and storage option that facilitates the process of data communication and transmission, making it efficient and effective. But if your business or government agency functions in any capacity related to the import/export of defense items as defined by ITAR, you also have a responsibility to ensure that your file sharing solution is legally compliant. Government organizations and companies that operate in the defense industry have a great deal at stake in the event of a data breach. If any information that’s subject to ITAR is vulnerable to being accessed by an unauthorized foreign party, you’re at risk of facing serious noncompliance consequences. ITAR provisions are intended to prevent the compromise of sensitive data associated with defense-related articles and services. Are you properly prepared to prevent this type of danger? Do you understand what data security steps you should be implementing to achieve compliance? FTP, also commonly referred to as "file transfer protocol," is a technology that allows businesses and private users alike to send and receive files to and from a remote system. Using an FTP client program (or web-based interface), files are uploaded from a source computer to the server for the purposes of file sharing, business continuity, backups and more. SFTP stands for "SSH file transfer protocol" and is an encrypted alternative to standard FTP. These are not the same technology and should not be treated as such, which is why the difference between SFTP and FTP is one that you should deeply understand moving forward. What Happens if I Accidentally Delete Files from my FTP Service Provider? User error is a tricky thing when it comes to data security. Regardless of how long you've spent behind a computer keyboard in your lifetime or how many advanced training classes you've had, one slip of your attention is all it will take to cause a virtual disaster in an instant. What Does ITAR Compliance Have to Do with Your Technical Data? When operating in the import and export of military or defense-related products, your company has much more to be concerned about than your everyday business needs. You must also be vigilant with government compliance and ensure that you’re following all International Trafficking in Arms Regulations (ITAR) managed by the U.S. Department of State. The International Traffic in Arms Regulations, or ITAR, is a set of government rules that control the export and import of defense-related articles, services and technology on the U.S. Munitions List (USML). It is a collection of critical compliance requirements that help to ensure defense technology and related technical information does not fall into the hands of anyone who is not expressly intended to have it. Organizations in the defense industry must fully understand if and how ITAR compliance requirements apply to them. Many mistakenly assume that this set of regulations only relates to tanks, missiles and weaponry, but in fact, it affects much more than that. In order to avoid the severe penalties and negative consequences of noncompliance, take the time to determine which elements of ITAR, if any, need to be addressed in your compliance efforts. Read on for answers to some fundamental questions regarding this matter. What Cyber or Data Security Threat Should I Be Most Concerned About? You don’t have to look far or wide to find an abundance of headlines highlighting the major cyber and data security threats ravaging businesses large and small. From phishing scams and ransomware attacks to information leakage and mismanagement, the dangers are numerous, varied and alarming. So, where should you be focusing your security efforts? What should you be most concerned about? Which hazards take top priority? Which File Sharing Solution is Best: FTP or SFTP? The process of choosing a file sharing solution for your organization can be hindered by paralyzing uncertainty surrounding the options at your disposal. Which offering provides the most efficiency and productivity benefits? How do you know if you’re selecting one with the proper security features? What’s involved in procuring a provider that best meets your needs? These are critical questions that help you make the smartest decision on implementing a file sharing solution for your business -- so it’s imperative to understand the answers before drawing a final conclusion. Understanding Your File-Sharing Alternatives: What Else Is Out There? There are a host of options on the market for businesses that require a way to share and manage their working files and information. Maybe the one your organization is currently using isn’t meeting your needs. Perhaps you’re looking for a higher level of security. Or you might just be interested in finding out whether you can procure a more cost-efficient alternative. Whatever the case may be, the search for the right file-sharing solution involves asking a number of important questions. For businesses that need a way to store, manage and share files and information, the cloud has become the go-to solution. It is the present and future of data management because of its mobility and scalability. These benefits are significant and worthwhile, but there’s more you need to consider. Whether you’re already relying on a cloud-based solution or planning to implement one soon, your top focus should be on secure file transfer. For years, hacking and breaches have become increasingly prevalent. And in this era of uber transparency, media members have shed a bright light on companies that have been comprised. But it’s not just the frequency with which breaches occur that have put greater emphasis on IT compliance policies. The cost of each breach has also grown over time. With the crippling financial and legal ramifications of data loss, preventing cyber criminals from gaining access to your information is a top priority. As much discussion as there is about breaches, preventing data loss is equally as important. There are many fundamental steps you must take to protect your data. The following categories are measures you should focus on to solidify your data security. The secret’s out: data is the key to business success. Well, maybe it wasn’t much of a secret. But the way some companies “protect” their data, it’s as if this information isn’t nearly as critical as it truly is. All of your employees need consistent access to different parts of your data. But to protect it and help it flow seamlessly between users, you need file sharing software to support and compliment your data security policy. Data is the lifeblood of nearly every business. Whether data about your customers, your industries or the inner workings of your organization, information can be your competitive advantage. But how safe is your data? Keeping your data secure is essential; data security itself is a competitive advantage. For all that’s discussed about hackers, addressing data leakage issues is equally critical to safeguarding your information. But first, what is data leakage? Think about all of the factors that contribute to the growth and success of your company. You’re probably tossing around concepts like a deep sales pipeline, a healthy employee program or even a strong commitment to customer service. These are some of the building blocks of a business that’s set to soar. Yet, none of them will save your company from the likes of a devastating security breach. Regardless of your organization’s size or industry, you are a target for cybercrime. To have any chance of achieving and maintaining the kind of success you’re planning for, it is absolutely essential to implement a proper IT security and compliance policy. Here are some of the most compelling reasons why. It doesn’t matter what kind of business you’re running, what industry you’re operating in or what size your company is, the truth is NO organization is completely safe from the danger of security breaches. Protecting your business from the threats that face your critical data and information is a crucial effort -- and one that must be shared by your entire company. Every individual with access to your systems is either part of the problem or part of the solution. To get everyone on board with helping to prevent harmful, costly data breaches, it is essential to develop a documented data security policy, one that encompasses all of the necessary components. IT professionals have their work cut out for them when it comes to ensuring the security of an organization’s data. Cyber security risks are present everywhere. From battling ransomware and phishing attacks to accounting for human error, your defenses must be strong and proactive. Unfortunately, the IT department can’t be everywhere at all times to thwart the myriad of dangers, and often the greatest risk is the company’s own employees. That’s why it’s so critical to bring employees into the conversation and help them become an active part of your file sharing security plan. Information technology continues to evolve at an unprecedented rate. For today’s businesses, that’s good news and bad news. Good because it brings digitally enhanced processes that save time and money. Bad because the inherent risks present new and mounting challenges for your IT department -- and your organization as a whole. For any company to successfully identify and mitigate those risks, they must be equipped with the most effective technologies and processes. Whatever industry your business operates in, you’re likely to be working with digital files containing sensitive data -- client, financial or proprietary information that you can’t afford to have stolen or compromised by a malicious attack. And it’s your duty to ensure that your organization’s critical data is protected. Many IT directors, business owners and operations managers who are tasked with this responsibility assume that as long as they implement a so-called “secure” file sharing solution, they are completely covered on the cyber security front. If you fall into this category, you are making a huge mistake, and here’s why. If you could have an open, honest conversation with a hacker, what would you learn? Chances are you’d uncover a lot about the vulnerabilities in your company’s network that cyber criminals prey on. You’d find out just how it easy it is for them to breach your system and compromise your data. You’d come away feeling pretty concerned about the weaknesses in your file sharing process, as well as the lack of data security training for your employees , and you’d want to take immediate action to secure your assets. No business is safe from the computer security threats that permeate today’s digital world. As the technology you implement to run your enterprise becomes more advanced, so do the cyber criminals trying to exploit your systems. It can be a frightening and overwhelming reality for companies of all sizes and in all types of industries. A single security breach has the potential to endanger your critical data assets, incur immense costs and even put you out of business. In the face of these risks, what is your company doing to defend itself? 50% of U.S. workers have a job that’s compatible with at least partial telework, and approximately 20-25% say they work remotely at some frequency, according to the latest statistics from Global Workplace Analytics. To say that the telecommuting movement is poised to be a short-lived one would be an incredibly misinformed statement. In fact, 80-90% of the U.S. workforce say they would like to telework at least part time, and studies show that employees are away from their desk 50-60% of the time. The business world has become a mobile environment, and with this reality comes the inherent risk of data security challenges. If you’re in business today, you likely have critical data being stored, accessed and shared for one reason or another. And that means you have a bull’s eye on your back -- one at which cyber criminals intend to take aim. As the advancement of cybercrime and technology intensifies, so must your efforts to protect your organization’s data. When it comes to cybersecurity for your organization, there are potential risks just about everywhere -- but there’s one that can be a real wildcard. We’re talking about your employees. In fact, anyone within your company could be opening up your business to dangerous, costly threats without even knowing it. And since one unexpected cyber attack has the power to bring your entire business to its knees, it’s essential to ensure that your data security policy includes effective strategies for mitigating the employee risk factor. Many small and mid-sized businesses don’t see their file sharing processes as a serious risk to the security of the company’s data, but this is a big mistake. The misnomer that large businesses are at greater risk of being hacked is a costly trap to fall into. You are in danger, and you must take action to safeguard your data, the lifeblood of your business. 2016 was a record-breaking year for cyber attacks, with billions of data points stolen or compromised, costing scores of businesses significantly. Unfortunately, the threat of hacker activity only grows larger and more complex as time goes on. Now more than ever, your business must be putting the protection of its critical data on the short list of major, urgent priorities. That means adopting secure processes and employing the appropriate managed file transfer solutions. Make no mistake: Regulatory compliance in the medical industry is a necessary component of healthcare cybersecurity. Healthcare IT professionals would be highly ill advised to neglect any efforts to ensure full compliance with HIPAA regulations. But when it comes to implementing a comprehensive, organization-wide cybersecurity plan, compliance is just one aspect. In fact, organizations that make the mistake of equating HIPAA compliance to full healthcare cybersecurity are putting themselves at serious risk. Maybe you’ve read about all the data breaches recently experienced by healthcare organizations across the country. Or perhaps you’ve seen the statistics on costly cyber attacks in the medical industry. Regardless of what incites you to take action, it’s clear that ensuring the security of your facility’s data assets is a non-negotiable. So, what’s your next move? Understand what you need to do in order to enforce HIPAA-compliant file sharing. Is Your SFTP Hosting Solution HIPAA Compliant? Can your healthcare facility afford to incur thousands -- or even millions -- of dollars in penalty fees caused by noncompliance with HIPAA regulations? Probably not. Yet, that’s the outcome you’re risking when you rely on SFTP hosting that’s not HIPAA compliant. As a governing regulatory body, HIPAA’s standards are designed to bring security and privacy up to speed with today’s increasingly digital world. Health records are no longer stored in an office filing cabinet, where a lock is all you’d need to keep the data protected. It's now stored digitally, which means that HIPAA has had to adapt. Do your digital file sharing and storage procedures fall in line with the HIPAA mandates that now govern this evolution in data handling? Every day, your healthcare facility deals with sensitive patient information. As employees manage files and share medical data, it is absolutely imperative to ensure the utmost in privacy and security. If you’re not able to keep patient health information safe, you’re at risk of facing serious penalties for HIPAA noncompliance. Advancements in technology and FTP software have made the sharing and storing of patient health information easier than ever before, but you must implement a solution that follows strict compliance regulations and makes security a top priority. With secure FTP, medical facilities can make sure that the technical safeguards required by HIPAA are met and protect themselves against paying thousands or millions of dollars in penalty fees. You’ve read many a horror story about cyber attacks that left businesses facing costly and severe aftereffects. So you know that ensuring the security of your company’s file sharing processes and data assets is of primary concern. But do you know what specific characteristics of an FTP host make it a highly secure option for your organization? Deciding to employ an FTP service (or an FTP alternative) for your organization’s file-sharing needs is only half the battle. Now you have to make a choice regarding which provider to use, and the selection process isn’t exactly an easy one. Unless you understand what factors will affect your organization in terms of security and productivity, you won’t be able to make an informed decision. Choosing the right option begins with asking the right questions about key considerations. One of those most critical considerations is the level of control that your FTP service provider offers. Administrators should be able to exert a great deal of control over access, including permissions and restrictions, to ensure that files are transferred securely at all times. Otherwise, you’re opening up your data to serious risk. There are many options for FTP services out there, but not all of them are compatible with the needs of your organization, including important requirements like security, accessibility, storage and support. When it’s time to decide on a service provider, you may be struggling to figure out which one will be the best fit. To help you make an informed decision, there are some key questions you should be asking about the compatibility of any FTP service you’re considering. Use the answers to these questions to compare your choices and weigh the pros and cons of each. This is the smartest way to select a provider that fulfills your highest priorities and meets your most vital requirements. You’ve been looking into your options for a file sharing solution that fits your financial services organization, but your search is turning up more questions than answers: How can we improve efficiency and productivity? Will a consumer-grade option work just fine, or do we need FTP hosting for enterprise?What degree of data security should we be focused on? What software features will satisfy the financial industry in particular? Which option will provide the most functionality with the least amount of difficulty for users? These are probably just some of the thoughts swirling around your head as you navigate the waters of file sharing knowledge and software selection. Could you use some clear-cut guidance on the matter? As digital innovation evolves, so does the threat of cybercriminal activity and other dangerous risks to valuable and sensitive information. It’s no wonder that when organizations seek to find a file sharing process that best suits their needs, the phrase “secure file transfer” is often a key component. Every financial organization has a need to share files among employees and even with outside partners or clients. The question is: What is the best solution for carrying out this exchange of data for carrying out this exchange of data in an efficient, organized, mobile and secure way? While many cloud-based file sharing options are becoming increasingly popular, the best decision for financial services organizations is often to rely on a hosted FTP site for storing and accessing critical business information. If you’re wondering why your financial institution should opt for this solution, here are some of the most significant FTP client features that make this option the best. FTP vs. SFTP: Which File Sharing Software Is Better for Your Financial Institution? When it comes to FTP versus SFTP, which software is the best solution for your organization? The answer can be reached by breaking down the most important file sharing requirements for your financial institution. Organizations that operate in the financial services sector must be extra vigilant about security and compliance with regard to transferring sensitive information. There are government regulations in place to ensure that client data is kept private and safe, such as the Gramm-Leach-Bliley Act (GLBA). These laws are aimed at safeguarding your customers and your business. Without strict adherence to them, your financial organization is open to dangerous risks, like costly data breaches. To avoid this kind of disaster, it is essential to use a file sharing software that meets the industry’s compliance regulations and protects your data assets. You’re on the hunt for an FTP service provider that will serve your organization well. But the available options are numerous and varied, and you want to be sure that you’re using the most valuable criteria to make the best possible choice. Not every FTP Server is going to meet the needs of your organization, so this decision is an important one. Where should you start? By understanding the features that are most critical to your operations. Equipped with this knowledge, you can weed out the options that fail to fulfill the necessary requirements. Use this detailed breakdown of essential features to look for in your search for a high-quality FTP Server that delivers the service and functionality your organization needs to thrive, and download A Comparison Guide of the Top 7 File Sharing Softwares to whittle down your list of providers. When it comes to selecting a file sharing or FTP software to support the transfer of critical business information, you have an important decision to make. It’s not about jumping on the option with the greatest hype. You have to think about crucial business factors like security, capability and ease of use. Your file sharing process must ensure that the organization’s valuable data is protected while enabling employees to carry out their tasks in an efficient and productive manner. If you opt for the wrong software, you’re at risk of facing a number of issues and challenges, which could ultimately jeopardize the business at large. Before you choose a new FTP software for your organization -- one that empowers you with productivity, profitability and scalability -- educate yourself on the following five complications associated with using the wrong solution. Then read A Comparison Guide of the Top 7 File Sharing Softwares to get more insight on how to make the best decision for your organization. Employees are not completely satisfied with the IT solutions provided to them at your organization. They find them difficult to use and probably don’t even know the entire gamut of features and capabilities that exist for their benefit. All they know is that they need to get their job done -- quickly and with the least amount of headaches. So, how are they coping? They’re downloading and using applications that work best for them, including consumer-grade cloud and file-sharing services. These solutions seem to be helping them work faster and smarter. The problem? They’re using these options without the approval of your IT department. 77% of IT and line-of-business decision-makers reported that departments within their organization have used a cloud service without the involvement of the IT department, according to a recent survey. Does your financial institution fall into this category? Are employees using cloud services or other applications that aren’t sanctioned by your IT team? If so, you’re dealing with Shadow IT -- and the risks are a serious threat to your business. Internet viruses are no small thing. If you think your company can’t experience serious consequences from a cyber infection, think again. They’re dangerous, they’re costly and they could be happening right now if you don’t have the proper protocols in place to ensure prevention. Discover three common ways your servers may be susceptible to harmful Internet viruses, and take FTP Today’s quick interactive quiz to find out if your business is practicing secure procedures to protect critical information. One of your employees hears a knock on the office door. He opens it and lets the looming visitor in. This visitor shows no signs of a threat, so your employee has no reason to be suspicious. The visitor then quickly and quietly maneuvers through the halls, locates some critical assets, locks them up and makes an announcement that if your company doesn’t fork over the requested cash, you’ll never see those assets again. Sound like an absurd scenario? After all, none of your employees would give a perfect stranger access to valuable company assets. Or would they? It’s no secret that ensuring the security of any company’s data should be a top priority. Yet, many businesses still don’t have the proper data sharing policies in place. Does your organization understand how to develop a controlled policy to protect valuable information and avoid putting your business at risk? Is Your IT Team Cringing at Your File Sharing Processes? This much you know: The ability to transfer files is essential to your business’s productivity. What you may not be aware of, however, is that your current approach to file transfer is putting your company at risk -- and sending your IT team into a tailspin. Your IT staff must control a multitude of issues surrounding the business’s file sharing processes. They’re responsible for protecting against hackers, setting access restrictions, complying with industry safeguards and preventing costly human error. Are your current file sharing processes making it difficult (or impossible) for your team to fulfill these duties? As a business leader, one of the most challenging battles you've likely been facing over the last several years has nothing to do with your team and its relationship to the marketplace, or even your company as it relates to its closest competitors. Instead, it's the internal war that is constantly going on between the IT department and the rest of the staff. The FTP host solution that you choose to power your business gives you a lot more than just the ability to send and receive files between two points. It gives you the flexibility you need to continue to grow and evolve as an organization. It gives you the peace-of-mind that only comes with knowing all of your industry-specific security concerns are taken care of - or at least, it should. Operating a domain without SSL encryption in 2016 is a bit like walking into a bad neighborhood after dark with a handful of $100 bills. At a certain point, you’re just waiting to be robbed and it is no longer a question of “if,” but “when.” Short for “secure socket layer,” SSL certification is one of the best ways to protect you and your business from the type of data breach that IBM estimates costs businesses an average of $4 million per incident. Setting up SSL certification for your own domain can seem like an uphill battle to say the least. SSL certification is undoubtedly important, but the process of actually generating your certificate and making sure that everything is configured properly can feel impossible if you don’t have an advanced computer engineering degree. Luckily, things aren’t nearly as difficult as they seem. You can actually activate an SSL certificate on your domain easily and on your own in just a couple of minutes – you only need to keep a few key things in mind. What Can FTP Sites do to Protect From Hackers? Though the Internet has undeniably made our lives better in a number of ways, it has also made the world more dangerous - particularly in terms of cyber security. According to the ITRC Data Breach Report from 2015, over 169 million personal records were exposed throughout the course of the year. There were a grand total of 781 different highly publicized breaches across nearly all areas of business - from the financial sector to education to government and even healthcare. To make matters worse, this is a problem that only seems to be getting worse over time. According to The Global State of Information Security Survey 2016 conducted by PWC, there were 38% more security incidents in 2015 than there were just a year prior. As the world around us continues to get more dangerous on a daily basis, maintaining compliance with governing bodies like ITAR becomes all the more important. Short for “International Traffic in Arms Regulations,” ITAR is a set of standards that deals with information security involving any parties that handle technical data related to the manufacturing, the exporting and a general involvement with defense articles or services. In other words, data files shared between the U.S Military and its military contractors. We have officially entered into an age where staying protected in terms of your business’ mission-critical data doesn’t just involve doing whatever it takes to ward off a potential cyber attack. Depending on the industry you’re operating in, you also will likely have one or more sets of government regulations that you must adhere to in order to maintain both secure and compliant at all times. The Gramm-Leach-Bliley Act, also commonly referred to as GLBA, is one such set of compliance rules that affects the financial services industry in particular. One of the most common misconceptions that businesses have in terms of file sharing is the idea that all services are created equally. In fact, there are two main categories that most providers fall into: consumer grade and business grade solutions. In order to maintain compliance with HIPAA, any business dealing with private health information or other electronic healthcare data will need to keep a few key things in mind. You will need to focus on not only network security but the physical storage of your data at the same time. All file-sharing activities must be validated and only people who expressly need access to a patient’s data to do their jobs should have access. You will need to remain vigilant about file transfers, using both at-rest and in-transit encryption to protect data security from all angles. One of the most important technological assets available to businesses in all industries today can be summed up in three simple-yet-powerful little letters: FTP. Short for “file transfer protocol,” FTP is a method of transferring files between computers, either over a local area network or over the Internet. They say that you just can’t put a price on the importance of keeping your data safe and secure in today’s tech-driven environment. What you can put a price on, however, is the failure to remain compliant with HIPAA if you’re a healthcare provider. This is something that Advocate Health Care Network has recently learned the hard way, after a lengthy investigation by the U.S. Department of Health and Human Services’ Office of Civil Rights put them on the receiving end of an incredible $5.55 million fine. The question of whether or not IT services providers need to concern themselves with compliance regulations like HIPAA seems to have been answered definitively and for all time. In July of 2016, the Catholic Health Care Services of the Archdiocese of Philadelphia, also commonly referred to as the CHCS, has agreed to pay a massive fine totaling $650,000 to settle violations relating to patient data that was stolen from a smartphone in their care. If you had to make a list of the most pressing digital threats that businesses face in today's modern environment, ransomware would undoubtedly be right at the top. In a ransomware attack, a host computer is infected by a malicious piece of software similar to a regular computer virus. In terms of file sharing features for business users, it's important to understand that not all FTP providers are created equally. Only by truly understanding the value of the best FTP site file sharing features for organizations like yours will you walk away with the high quality service you need when you need it the most. When you begin investigating your cloud-based file sharing options for your business, one of the first major decisions you will have to make involves whether to go with a public or private FTP cloud provider. One of the most difficult aspects of keeping up with modern technology is the break-neck pace at which it continues to evolve. You invest a huge sum of money in the "latest and greatest" in January, only to find those resources woefully obsolete come July. Almost as bad is the amount of guesswork involved - you may think you need X number of solid state drives for storage, but what if you're wrong? As time goes on, the average size of a file that you're dealing with increases dramatically. Even ten short years ago, sending a file larger than 25MB in size would practically be unheard of. These days, it is not uncommon to need to send a file that is several hundred megabytes or a gigabyte or more at any given time. We have entered into an age where file sharing is less a luxury as it once was and more a way of life. More and more industries are choosing to unlock the productivity and collaborative gains that only file sharing can offer, which is especially true in the world of government. Graphic designers share a huge number of files on a daily basis for a host of different reasons. Sometimes it's just easier for two graphic designers to collaborate on the same project remotely rather than both coming into the office. Other times they need to share large mock ups or design files for customers for final approval. In these types of situations, only FTP file transfer can bring all of the benefits that graphic design companies need with none of the potential disadvantages.